The Booted Eagle is a small, buzzard sized eagle found in a wide range across Southern Europe, South Asia and Sub-Saharan Africa. It seemed to be the most easily seen of the five Eagle species found in Spain - we saw at least 3 separate individuals, including one "dark phase" individual - that makes up only a small percentage of the birds found in Spain, which are mostly "light phase". They feed mostly on small mammals, reptiles and birds. This one here was holding something that looked suspiciously like it could have been a snake. - MADRID 2016 TRIP: Single individual seen in Monfrague. 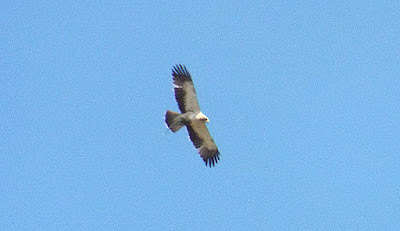 * There is a bit of uncertainty with several aspects of the Booted Eagles' taxonomy - it is variously considered part of Hieraaetus or Aquila for genus, and considered to have either zero, two or four subspecies. I can't find much information on which of these is supported by who, if it gets resolved in future I'll amend this page.